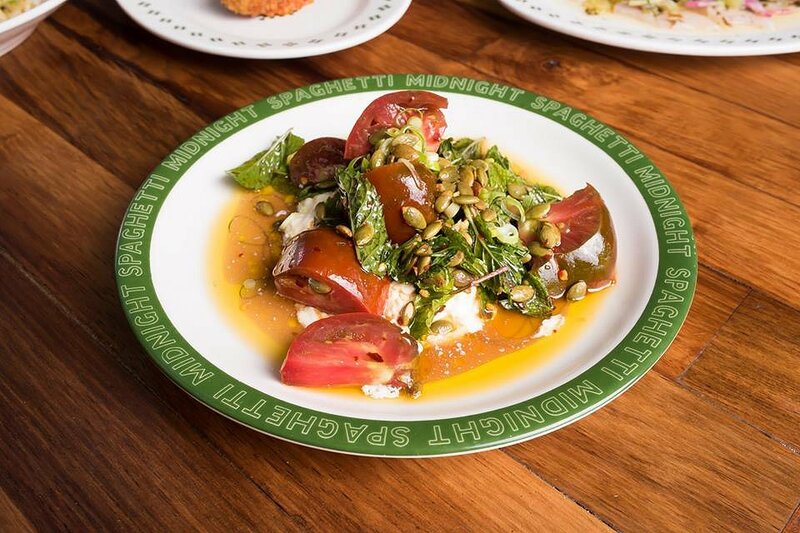 Midnight Spaghetti is the perfect place to come for a casual bowl of pasta or drinks with friends. Whether you’re celebrating or just clocking off, Midnight Spaghetti provides a fantastic menu and atmosphere to enjoy. Located just above the Crown & Anchor pub on Grenfell Street, this quirky restaurant is welcoming and playful. Pictures of Hollywood stars eating spaghetti decorate the walls along with real plants and a DJ that played the best vinyl playlist. Midnight Spaghetti has one of my favourite decors, very vintage and eccentric. It brings the look, sounds and tastes of yesteryear flooding back. 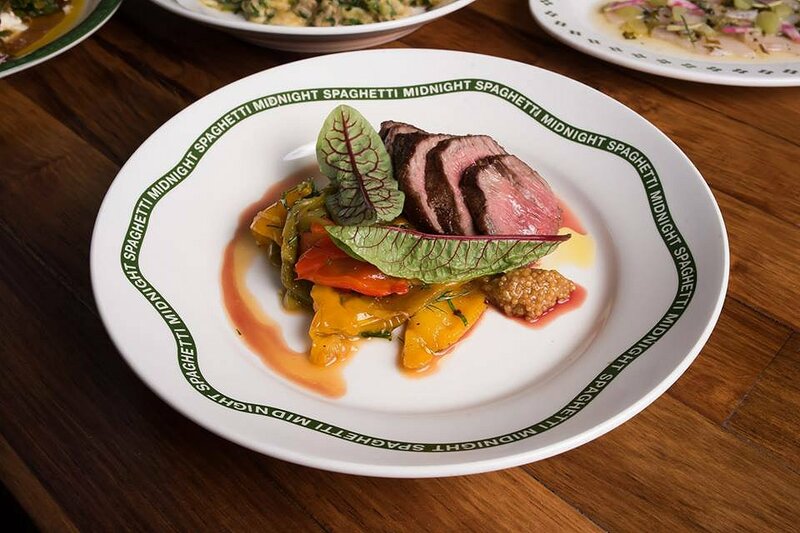 Chef Jess Barnes has curated a menu that exceeds our expectations. Think mouthwatering Italian dishes with a twist, Jess’ menu has it all. We loved the many flavours that Jess joined together to bring us this fabulous menu. Midnight Spaghetti brings comforting Italian recipes with Jess’ innovative flair, perfect for any night out! 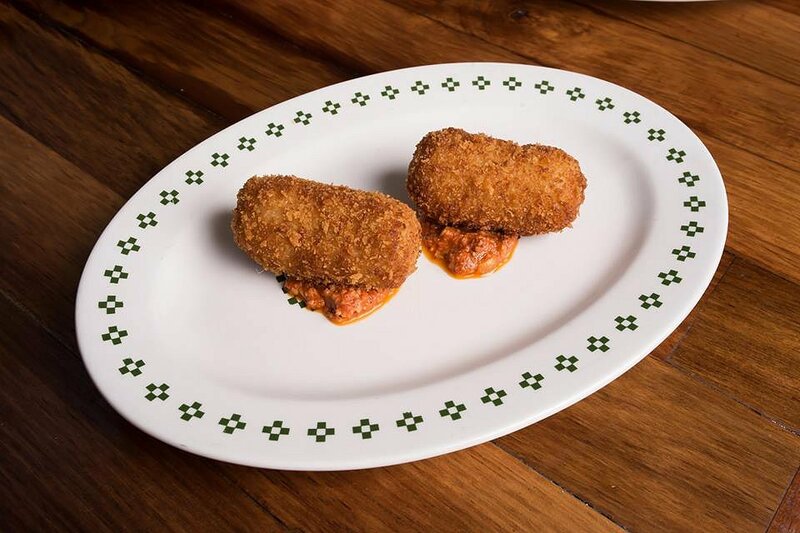 Two deliciously crispy fried crochettes are served with a helping of zesty Bolognese sauce. Filled with cauliflower, macaroni pasta and three cheeses, these plump starters are to die for. We loved how fresh and crispy they were, and how the cheesy flavours paired excellently with the tomato sauce. If you’re after a more refreshing starter, this fresh Kingfish is for you. 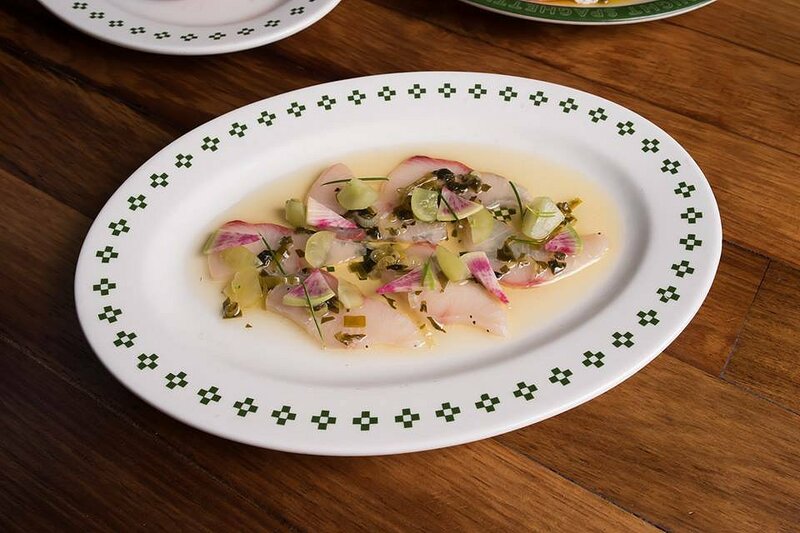 Delicately sliced with a silky-smooth texture, Jess’ Kingfish Crudo has our mouths watering. Dressed with seaweed, apple and cucumber, this starter is a perfect predecessor to a hearty pasta dish. The fruit adds a perfect sweetness and crunch and complements the fresh fish. This steaming hot pasta dish is enhanced with fresh broccoli florets, chilli and pork sausage. The pasta is soft and flavourful, we loved the slight hint of heat from the chilli. 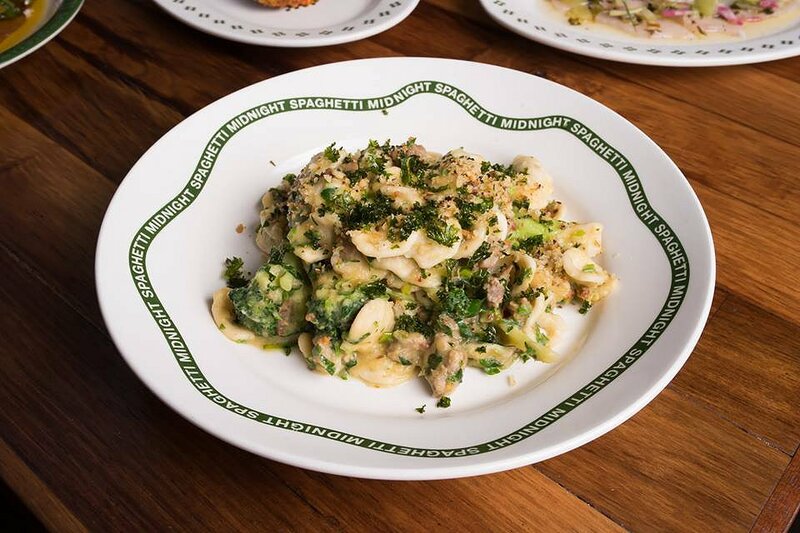 The chunks of broccoli were a great addition for taste and texture, along with the tasty forkfuls of pork and fennel sausage. This pasta is even better with a generous sprinkling of grated parmesan cheese. These flavour-packed parcels stole the show for us! This tender ravioli is filled to the brim with a tasty prawn filling and finished with a gravy sauce. Sweet and sour flavours mix together to create this wonderful dish. 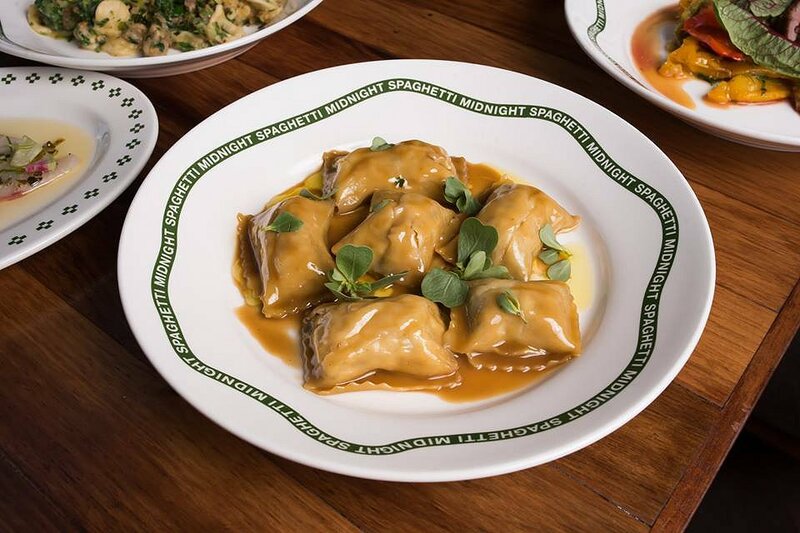 Great to share or to have as a main dish, this ravioli is exceptional and not one to miss. What’s a menu without a steak? Jess has blown us away with this mouthwatering, juicy steak. This steak is like butter to cut and way too easy to eat. Paired with sweet roast peppers and tangy mustard seeds, the flavours of this dish mingle together perfectly. Great with a pint of beer from the bar, this steak is the ultimate pub-grub dish. There’s nothing better than soft cheese and fresh salad. Italian buffalo cheese is encapsulated with tangy tomatoes, fresh mint and an olive oil dressing, this salad is everything you could want for a summer dinner. We loved the contrast of the creamy cheese and the zing of mint. To experience first-hand the delights of Midnight Spaghetti, you can visit them for dinner from Wednesday-Sunday from 6.00pm-late. On Wednesday’s, they host “family night”, with $15 bowls of spaghetti and cheap jugs to match the Crown and Anchor’s famous $3 schooner night. Looks like a party all around!